When one square meal a day, which is essential for the body is difficult to obtain, even the thought of seeking medical treatment may be termed a luxury. Poverty-driven lack of education results in the neglect of an important aspect such as cleanliness. Also, inadequate food intake leads to malnutrition, which furthermore, leads to serious health issues. Various reports have highlighted, the problem of malnutrition is the most serious in India. The situation has not changed much even though the country is developing at a very rapid pace and differences between the cities and villages, are slowly fading away. Problems such as malnutrition, weakness and anaemic conditions are highly prevalent among women and young children in the remote rural communities. Thus, one cannot deny the fact that these fundamental health issues lead to a multitude of more serious ones. However, Dr Aniruddha Dhairyadhar Joshi namely Sadguru Shree Aniruddha (Bapu) has demonstrated that the conditions can be changed in places where such issues exist when efforts are made in the right direction and with in-depth research. 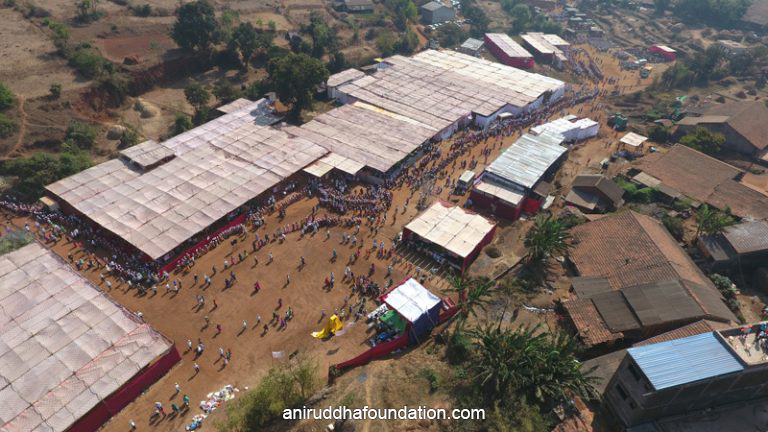 The Healthcare Camp was initiated in the year 2004, in a small village of Pendakhale, situated about 30 kilometres from Kolhapur under the guidance of Sadguru Shree Aniruddha. Today, 14 years later, conditions in Pendakhale and its neighbouring villages have witnessed a complete transformation. 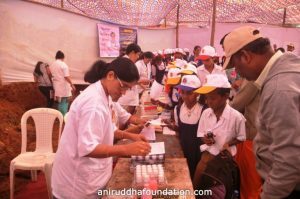 Shree Aniruddha Upasana Foundation, Dilasa Medical Trust and Rehabilitation Centre, Shree Aniruddha Aadesh Pathak, Aniruddha’s House of Friends and other associated organisations come together and organise the “Kolhapur Medical and Healthcare Camp” on a large scale. 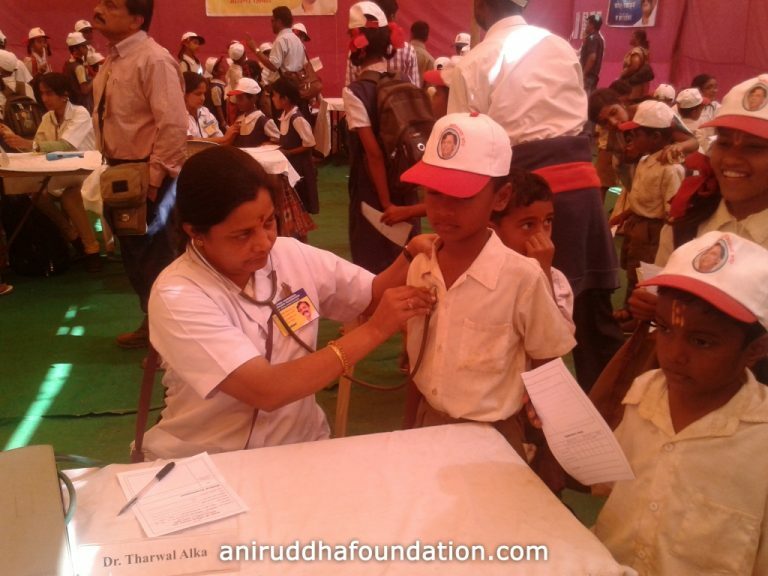 The comprehensive nature of the ‘Kolhapur Medical and Healthcare Camp’ as also the efforts put together by Shraddhavan volunteers, for its surveys, study, planning and organization of the event is really astounding. Various organizations conduct medical camps in many parts of the country. However, the ‘Kolhapur Medical and Healthcare Camp’ aims to focus not just on providing health check-ups and distributing free medicines, but on the eradication of the root cause of all the health issues altogether. 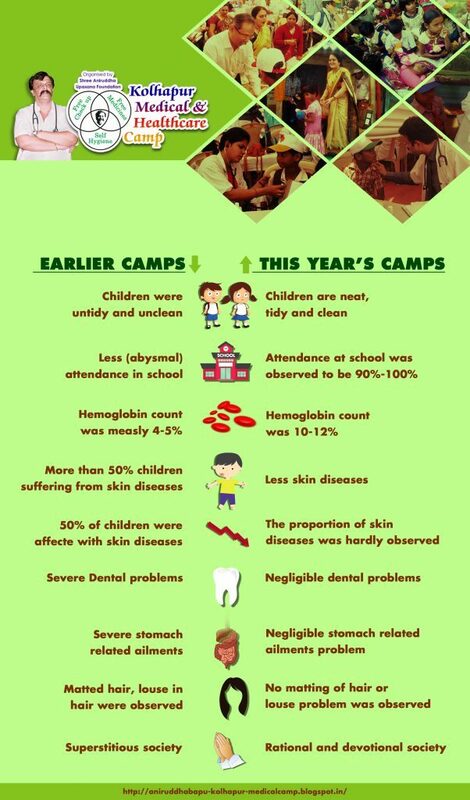 The primary theme of this camp is to encourage preventive measures, rather than to cure the diseases after infection. In-Depth and extensive research is undertaken before conducting the camp, the planning for which continues throughout the year, where all the potential issues are reviewed from each and every angle. One may ask as to why the foundation selected Pendakhale village alone for organizing the Medical camp?’. Pendakhale and its neighbouring villages, which are situated just 30 kilometres away from the Kolhapur city, were suffering from extremely critical cases of malnutrition and other health issues. Serious financial difficulties plagued several villagers. The living conditions of the villagers met the criteria established to qualify for organizing the medical camp. At the same time, the availability of a strong team of disciplined Shraddhavan volunteers in large numbers, in Kolhapur and its surrounding areas resulted in the selection of the Pendakhale region for setting up the Medical Camp. In 2004, the first-ever camp was organized in the Karanjphen village, which is situated near Pendakhale. Later from the year 2005, the Camp is arranged at the Pendakhale village itself. Dr Aniruddha Dhairyadhar Joshi also known as Sadguru Shree Aniruddha Bapu, is a highly qualified Physician, an M.D. (Doctor of Medicine). Bapu commenced his activities in social work under the Dilasa Medical Trust from the year 1985 and has undertaken many social causes through the foundation. The medical camp is one such important initiative. 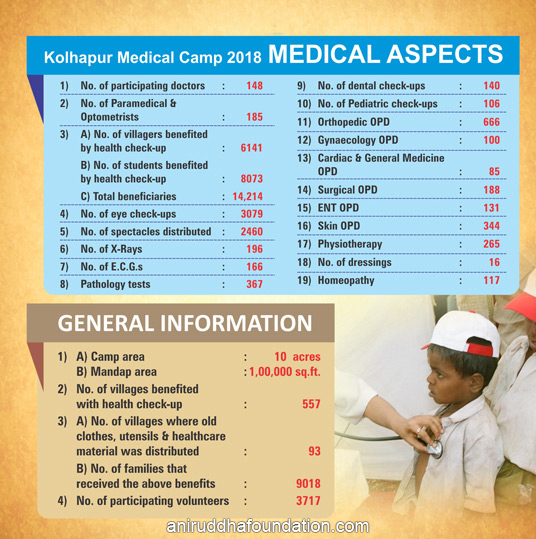 Before the Kolhapur Medical and Healthcare Camp, the organisation would arrange for a Medical and Healthcare Camp at Methi village – a predominantly tribal area in the Dhule district. It significantly improved the health and living conditions of the tribal hamlets in and around the Methi village. The villagers became wary of health issues which developed a higher level of confidence among them. Subsequently, with the experience gained from the Methi Medical Camps, the initiative of Kolhapur Medical and Healthcare Camp was undertaken. With scientifically-backed comprehensive surveys conducted in the area, the camp thus commenced. Although it is a 2-day camp, the preparations for it continue throughout the year. About 4,000 Shraddhavan volunteers are available to offer services at the camp, which include about 1,000 volunteers from Mumbai. They also include expert medical professionals as well as the paramedical staff. Unhygienic living conditions resulting from bad habits invite various diseases. The surveys which were carried out before the camp, clearly indicated that contaminated water, open defecation as also lack of physical hygiene and clean surroundings were the primary causes of health issues. Almost all villagers were found to be moderately or even highly anaemic. The health issues that arose due to wrong beliefs added to it furthermore. Taking all these factors into consideration, apart from just medical services, medicines and the items which serve as everyday essentials, are also provided to the impoverished, while school uniforms and sports equipment, and the like are distributed among the school children. A detailed survey is carried out to determine the number of households in the region, as also the areas that are in need of the supplies, followed by the preparation for the camp. The preparations are carried out throughout the year and finally culminates into a 2-day camp, organized in an exceptionally well planned, disciplined manner, without creating any disarray. Items of daily necessities such as dental powder, soap, water purifying solutions, lice medication, quilts, clothing, utensils, etc. are distributed among the villagers. Combs too are distributed, particularly to prevent matting of hair among young girls. They are also educated about maintaining proper hygiene. Also, ladies are provided with sarees (6-yard and 9-yard sarees), bangles and bindis. This distribution is conducted on the first day of the camp, which begins early in the morning. Shraddhavan volunteers reach the previously surveyed villages, in tempos loaded with all items meant for distribution prepared in the form of bundles(enclosed in a cloth wrap). The packets of things are arranged explicitly for each family living in that village. 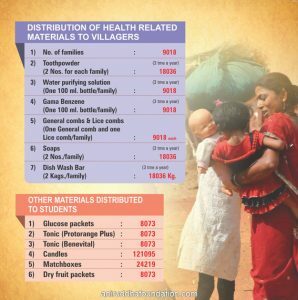 In the year 2018, such bundles along with many other items of daily necessities were distributed to 9018 families spread across 93 villages. A Satsang is organized for the volunteers as recreation on their return to the camp after a long, tiring day. The Medical camp commences on the second day. The villagers and students begin to arrive at the Pendakhale village quite early in the morning. Students from several local schools, attend the medical camp along with their teachers in large numbers. Thereafter, school uniforms are distributed among the students free of cost. Sadguru Shree Aniruddha’s Shraddhavan friends prepare hanks under the Charkha Project by spinning the charkha, used for weaving the fabric from which uniforms are then made, and distributed at no cost among the school children. 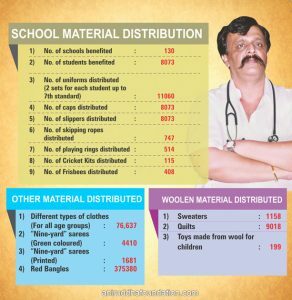 Time and again, it has been experienced at the Kolhapur Medical and Healthcare Camp, that the school uniforms which are a product of such devotional services, have the potential of giving a significant turn in building the future of the school children. Additionally, free footwear is distributed among the school children. Previously, many villagers would walk on bare feet, before the camp was initiated in the region. The young children had never used any footwear prior to the camp. Thus, one could notice the joy and astonishment off the children’s faces on receiving their first-ever new and unused slippers. Free caps are distributed among the children attending the camp. Registration of the visiting schools and each of its students is carried out, after which they receive a free medical check-up. Free vitamin supplements and packets of dry fruits are then distributed among the children to provide them with the required nutrition. Apart from this, they also receive free candles and matchboxes to help them study, even after sunset in the regions which lack an adequate power supply. The distribution of candles and matchboxes is carried out under the Vidya Prakash Yojna (Light of Knowledge project), one initiative from the 13-point programme of Sadguru Shree Aniruddha. Schools attending the camp are given sports equipment sets such as those required for playing cricket, skipping ropes, rings, footballs, Frisbees, and the like. The educational aspect of the camp proves to be necessary for the children, to develop a physically and mentally strong future generation for the country by imparting basic education to them. Two of the beneficiaries of this camp have now completed their medical education, which is evidence enough to reveal the grand success of the camp. A lot of thought is put into selecting the items to be distributed. For instance, you may consider the distribution of combs and lice medication. The non-availability of combs used for combing hair regularly increases the risk of developing matted hair. As per an incorrect old custom, young girls who developed such a hair condition were sent away to serve as a ‘Devadasi’. Matted hair is actually a result of unclean hair and lack of proper combing. The distribution of combs and lice medication has saved many young girls from becoming a victim of such wrong beliefs. It highlights the critical nature of even seemingly simple and trivial things. Several villagers from the neighbouring villages visit the camp. Every year, nearly ten to twelve thousand people in need of medical attention, are registered here where they receive free medical check-ups, consultation and treatment. A provision that facilitates to offer a range of services from just a simple physical examination to the facility for an X-ray is made. People who are in need of glasses, receive an eye examination and free spectacles accordingly. ECG facilities are also made available in the medical section. Additionally, dental check-ups and treatments are provided as well. In 2018, more than 14,000 people were examined at the camp free of cost. Whereas, a total of 8,073 school children from 130 schools availed of the medical check-up facilities. 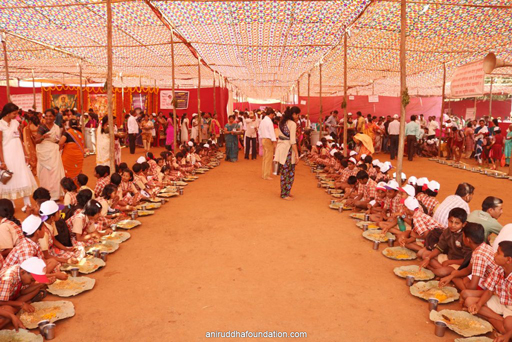 Every beneficiary of the camp is provided free meals under the ‘Annapoorna Mahaprasadam’ initiative. The initiative is a great boon to the camp participants, who begin their journey early in the morning all the way from their villages to reach the site over long distances, that too in scorching heat and often, on an empty stomach. The sight of villagers and school children enjoying a full meal to their heart’s content is an extremely satisfying experience. More than 50,000 villagers enjoy the meals at the camp, who are served with love, affection and personal attention. Whereas, the food is cooked with just as much love and affection in huge-sized vessels, by hundreds of volunteers who render the devotional service. The landscape of the region has undergone a complete transformation due to the camp. It has raised the level of awareness about health-related issues, among the locals. They have understood the importance of cleanliness and hygiene. Moreover, health-related complaints of the villagers have come down significantly. Being convinced of the importance of maintaining personal and environmental cleanliness, the villagers are adopting clean habits and hygiene in their daily lives. The number of leprosy patients has dropped notably as also the extent of contagious diseases which has drastically plummeted. Contaminated water-related diseases have been completely eradicated. Whereas, the number of beneficiary villages and schools availing facilities at the camp, has risen as well. Schools participating in the camp, have seen an increase in the number of students. Furthermore, the performance of the schools has improved significantly. Also, villagers are now well educated about family planning. Gynaecologists express content at the level of awareness among them. Many of such positive aspects of the camp may be considered. The foundation for Sadguru Shree Aniruddha’s (Bapu) social work, has always been Bhakti (devotion) and spirituality. Bapu says selfless service (seva) can be built only on the foundation of Bhakti. 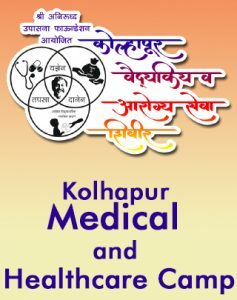 The Kolhapur Medical and Healthcare Camp is based on the twin principles of Bhakti and Seva. Many villagers who participate in the camp have followed this path and learnt to look at life positively. It demonstrates the power of Bapu’s teachings. Sadguru Shree Aniruddha’s sense of compassion for the common man as also for the underprivileged is evident through this initiative undertaken by him.